On the Stogie Geeks Four Year Anniversary Show, La Flor Dominicana Vice President of Sales Jonathan Carney announced the second installment of the La Flor Dominicana Special Football Edition cigar. Early in 2015, the first Special Football Edition was released exclusively to retailers in the State of Arizona, the home state for the 2015 edition of the NFL Championship. This year, the La Flor Dominicana Special Football Edition 2016 features a new blend and a new vitola. Given the 2016 NFL Championship game is being held in Santa Clara California, the Special Football Edition 2016 has been released as an exclusive to the State of California. 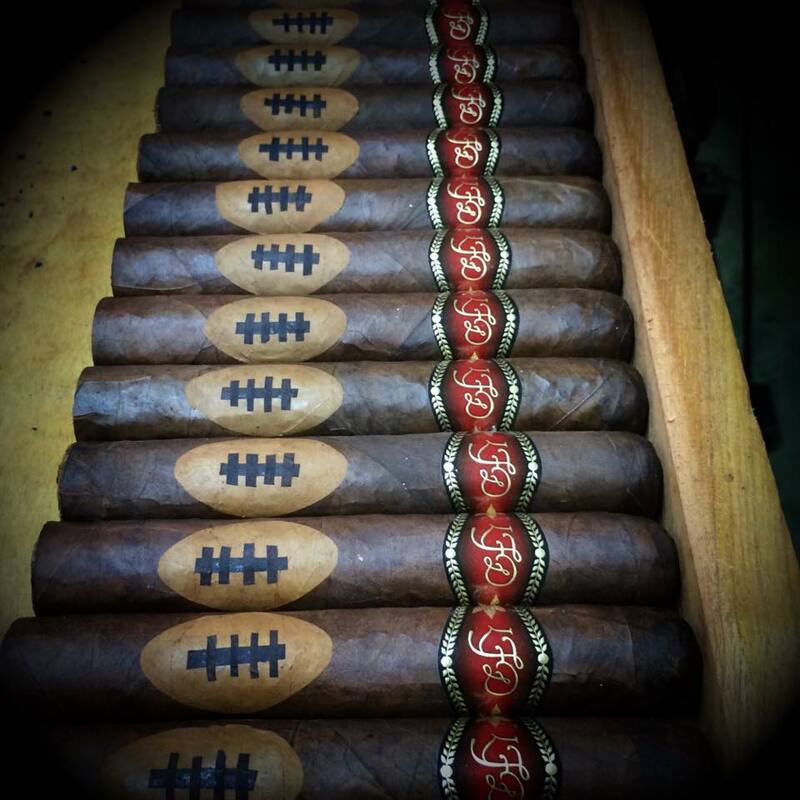 Recently I’ve had an opportunity to smoke the La Flor Dominicana Special Football Edition 2016. Not only did I find this to be a cigar the excels in craftsmanship, but a cigar that delivers an excellent flavor profile as well. TheLa Flor Dominicana Special Football Edition 2015 was a 5 5/8 x 60 parejo that was highlighted by a tobacco leaf cut in the shape of a football. For the La Flor Dominicana Special Football Edition 2016, this is a 5 5/8 x 54 figurado. The football-shaped leaf on the 2016 is different than the 2015 edition. In addition, the figurado is accented by two strips of tobacco meant to represent yard line markers. La Flor Dominicana is one of two companies delivering high profile cigars to commemorate 2016’s “Big Game”. Camacho Cigars recently has released the Ditka Special Game Day Edition to also coincide with the NFL Championship. The base wrapper of the La Flor Dominicana Special Football Edition 2016 features a dark Ecuadorian Habano wrapper. A Connecticut Shade wrapper is used for the football-shaped leaf and the thin strips used to accent the cigar. 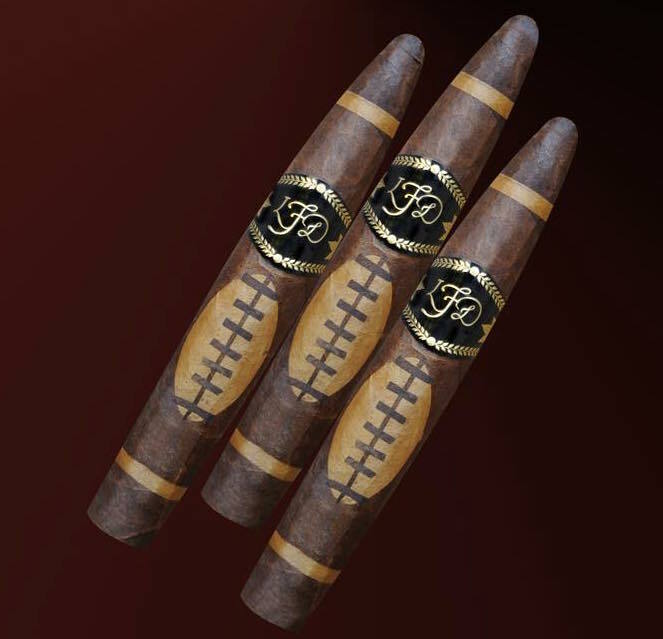 As mentioned La Flor Dominicana Special Football Edition 2016 is available in one size – a 5 3/4 x 54 figurado. The cigar is available in ten count boxes. The Ecuadorian Habano wrapper of the La Flor Dominicana Special Football Edition 2016 has a coffee bean color. Upon closer examination, there is some darker marbling that can be seen on the surface. The wrapper itself has a light oily sheen. There were a few visible veins while the darker color of the wrapper does a good job at hiding the wrapper seams. 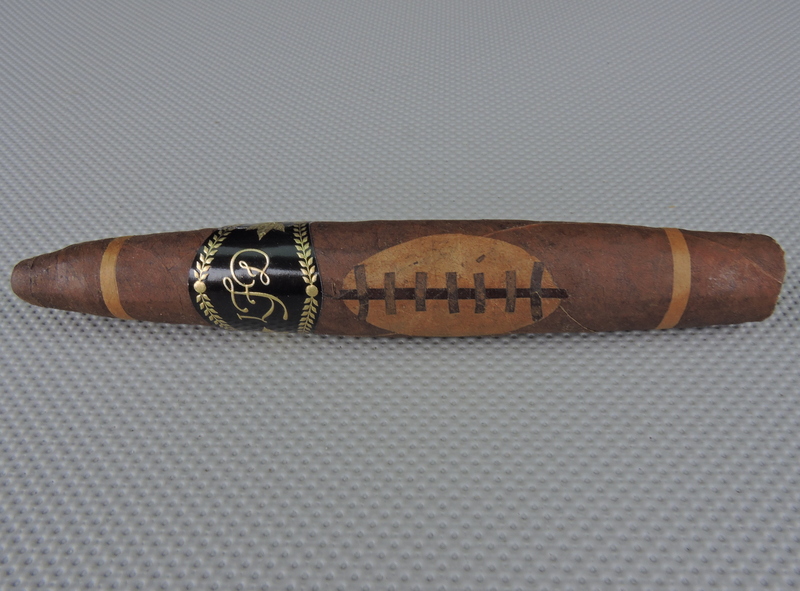 The football-shaped leaf sits on the lower half of the cigar. The accent strips representing the yard lines are almost an inch from the cap and footer respectively. There is a slight taper toward the footer,while the tapering toward the cap is sharper. The band of the La Flor Dominicana Special Football Edition 2016 has a black background with gold font. On that background it has the classic LFD gold script logo. The band has what I term classic “LFD gold adornment” for trim. On the left and right side of the script logo, there is both a gold leaf and a gold medallion. Given the La Flor Dominicana Special Football Edition 2016 has a sharper taper toward the cap, I defaulted to a straight cut. As I have being doing with most figurados and salomons, I used my Credo Special T cutter with the 36 ring gauge hole to get an ideal cut for this figurado. The cold draw delivered a mix of coffee and earth notes. While this wasn’t an overly complex draw, I still found it to be excellent. At the point, I was ready to light u my Special Football Edition 2016 and see what the smoking stage would have in store. The La Flor Dominicana Special Football Edition 2016 started with a combination of coffee and white pepper notes. There was a hay-like note in the background. The retro-hale produced a combination of coffee and pepper notes. Once the cigar reached the Connecticut Shade strip by the footer, the hay notes joined the coffee notes in the forefront. During the first half of the Special Football Edition 2016 I found the coffee and hay alternated as a primary note. Toward the start of the second third, the retro-hale moved more toward being solely a white pepper note. By the second half, I found a cedar note emerged on the tongue. The cedar notes didn’t take long to move into the forefront and joining the hay notes. The coffee notes receded into the background and joined the white pepper. Toward the end of the second third, the pepper notes increased. By the last third, the pepper notes were in the forefront with the hay and cedar notes. I still picked up some coffee notes in the background. This is the way the cigar experience of the Special Football Edition 2016 came to a close. The resulting nub was cool in temperature, but slightly soft to the touch. The burn of the Special Football Edition 2016 took a straight path from start to finish. The burn line remained straight for the first half. I did notice by the second half this cigar needed more touch-ups than in the first half. Similarly, the resulting ash was firmer in the first half than in the second half. The ash itself had a very light gray color. The burn rate and burn temperature remained ideal. The draw was excellent. It had a touch of resistance to it – which is something I like. This made the La Flor Dominicana Special Football Edition 2016 an enjoyable cigar to puff on. From a both a strength and body perspective, I found the Special Football Edition 2016 to fall in the medium to full range. There was a slight increase in strength and body along the way, but overall I found these attributes remained in the medium to full range right until the end. The strength and body balanced each other nicely with neither attribute overshadowing the other. Over the years, La Flor Dominicana has been a leader when it comes to delivering cigars of what I call an “artesian” quality. The La Flor Dominicana Special Football Edition 2016 becomes the latest cigar to fall into that category. It’s a cigar that LFD fans will easily want to have in their collection. On top of it, this cigar delivers an excellent smoking experience. The burn of the Special Football Edition 2016 wasn’t perfect, but this is still an excellent cigar with the pluses far outweighing the minuses. While this is a cigar I’d recommend to a more experienced cigar enthusiast, this isn’t a cigar I would not discourage a novice from trying. As for myself, this is a cigar I’d want to have in my collection and smoke again. On the smoking experience alone, it’s easily a box worthy cigar.